Tell Elizabeth that she’s not going to die. Take her upstairs, and put her to bed. Take a phone message for Julia. Consult with Julia about Liz’s condition. Blame Cassandra for everything. Lose track of where Elizabeth is. Lose track of where Amy is. Find Elizabeth and Amy at the mausoleum. Bring them home. Put Elizabeth back to bed. Tell her that she’s not going to die. Offer a sedative. Tell her that it’s all in her mind. Discuss hiring plans for a new governess. Scold Amy for going outside without permission. Brief Maggie and Joe on the recent disturbances. Bring Maggie upstairs for her job interview. Go through the onboarding checklist with her. Make sure she has a keycard. Drive to Maggie’s house to see if Joe’s okay. Scoop up the remains, and drive it back to Collinwood. Deposit blood-stained trauma victim on the drawing room couch. Insist that Joe stay the night. Prepare a bedroom for him. If you get a chance: ask him what it’s like to have a real storyline. So that’s the thrilling story of Barnabas the butler, supporting character. You know, I can remember back when Barnabas was an unstoppable force of destruction. It wasn’t really that long ago. People like to say that the vampire was “redeemed” as soon as Vicki came back from 1795, but that’s not true. He’s been taking hostages and conspiring to decapitate people this whole time. I mean, it was only three months ago that he was planning to kidnap Maggie, and sacrifice her in an unholy mad science experiment. Now he’s sitting down with her to go over the benefits package. Making Barnabas “good” is not a positive outcome; it’s a huge problem. Turning Barnabas into a butler has the potential to break the entire show. Nobody really wants Barnabas to be “good”. Being good is only important if the character is a real human being who you’re planning to interact with. This is not actually the case, so anybody who thinks that’s what they want is really misunderstanding how storytelling works. The hard truth is: what’s good for the character is almost always bad for the audience, and bad for the show. For example, take young Christopher Jennings. Yesterday, Chris turned into a werewolf and almost killed his cousin Joe, one of his two living relatives. Joe stabbed Chris in the shoulder with a pair of scissors, and barely escaped with his life. Later, Joe showed up at Chris’ hotel room and learned his terrible secret, and then Chris asked Joe to take a pistol and shoot him as he transformed once again into a wild beast. That was one of the worst days of Chris’ life. It was basically every nightmare that he’s ever had, all at once. It was also one of the best episodes we’ve seen in a long time. So the writers have no use for a happy Barnabas. For a soap opera writer, the word “happy” is followed by “ending”, and the word “ending” is followed by cancellation, failure and unemployment. 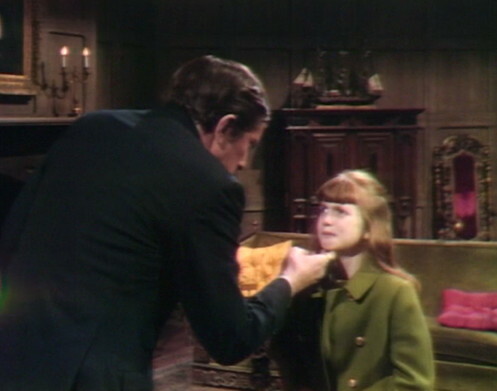 And the terrible truth of this moment is that Barnabas’ story is over. You can follow a clear path through Barnabas’ storyline from April 1967 to December 1968. Willie opens the mystery box, and Hell breaks loose. 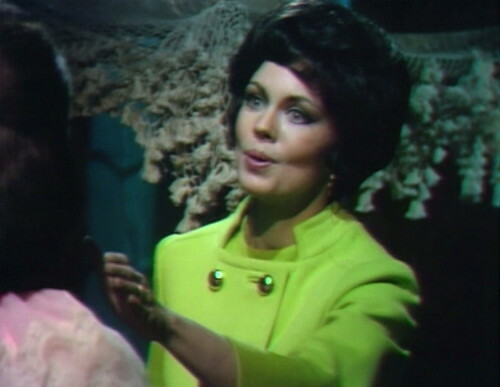 Barnabas kidnaps Maggie. Julia strikes a bargain with the devil. Vicki travels through time. Angelique throws a curse so powerful that it distorts history. Roger marries a woman that he hardly knows. Carolyn is trapped in a root cellar. Dr. Lang has a heart attack, Sam goes blind, and Harry puts poison in Joe’s medicine. And all of that, every weird twist and turn — it all connects back to the box, and Willie Loomis’ original sin. The vampire character that was only supposed to last for thirteen weeks has single-handedly powered the storyline for almost two years. And now, thanks to the Great 1968 Wrap-Up, that storyline is almost complete. 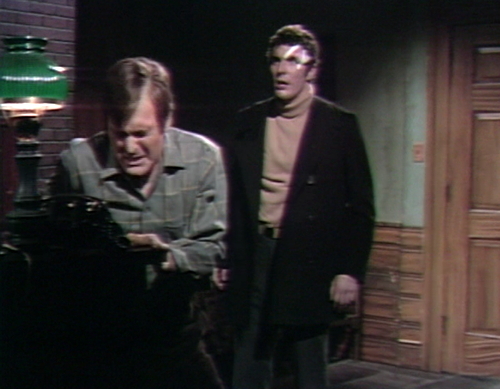 Now we’re sinking our teeth into the two big storylines of 1969 — Quentin’s ghost, and Chris the werewolf — and Barnabas isn’t involved in either one. I’m not sure that Barnabas has met Chris yet, and he’s never even heard of Quentin. As the crowning blow, we see Angelique — Barnabas’ personal bespoke nemesis — twice this week, and she doesn’t even mention him. Barnabas is done. But try telling that to the audience. 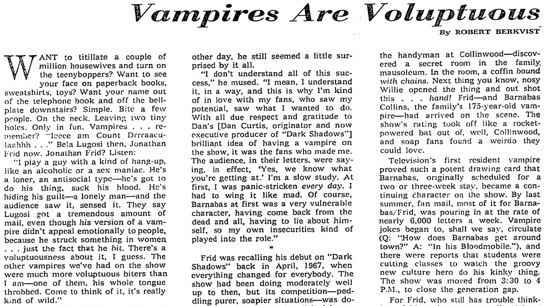 On December 29th, two days after this episode aired, The New York Times printed a peculiar article about Dark Shadows called “Vampires Are Voluptuous”. Yeah, it sure is, and the wildest thing about it is that Jonathan Frid hasn’t played a vampire in eight months, so I don’t know why they’re saying that he’s better than Lugosi. Sure, Lugosi’s been dead for twelve years, but in this racket that’s not necessarily a disadvantage. But if everybody’s still sending fan mail to Barnabas, then he needs to stay on the show, even if he has nothing to do. They just need to find a role for his character to fill. Lately, the show’s been reaching out to the young set, those mad middle-schoolers who are buying the Barnabas board games and trading cards. 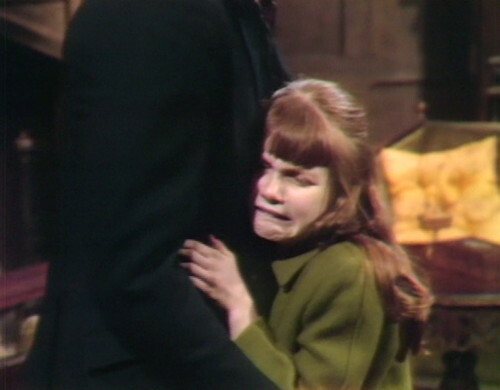 And all of a sudden, wouldn’t you know it, Barnabas has an instant relationship with little Amy Jennings, who hugs him, and tells him that she’s afraid of the moon. This is basically what happened with Gamera, the giant rocket-powered monster turtle from Japan. 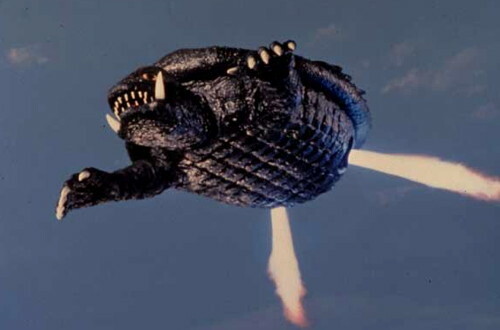 In the original 1965 movie, Gamera was your standard kaiju engine of destruction, rampaging through Tokyo until somebody figures out how to shoot him into outer space. You wouldn’t think that kids would get particularly attached to a homicidal reptile war machine, but kids respond to fiction the same way that adults do — they like the interesting thing. That’s why you see kids fascinated with Gamera, and Darth Vader, and Barnabas Collins. It doesn’t matter whether they’re officially designated as “good guys” or “bad guys”. They’re the guys you pay attention to. So this is the new Barnabas, accidentally. It’s not a particularly voluptuous role, and it’s certainly not something that anyone planned. But it’ll do, for now. In act 1, just before Julia and Carolyn go into the foyer to pick up Carolyn’s luggage, a crew member’s head passes by at the bottom of the screen. In the dream, when Liz is startled by laughter, you can see where the “grass” covering ends on the studio floor. When Amy runs into Collinwood in act 3, she doesn’t close the door behind her, although there’s a sound effect of the door slamming shut. Over the next minute, Joe walks in and out again, and the door just stays open. Danny, I’m surprised you didn’t mention the moment where Julia “Take that!” Hoffman smacks Joe Haskell in the kisser for being hysterical: Loony-bin, party of one. 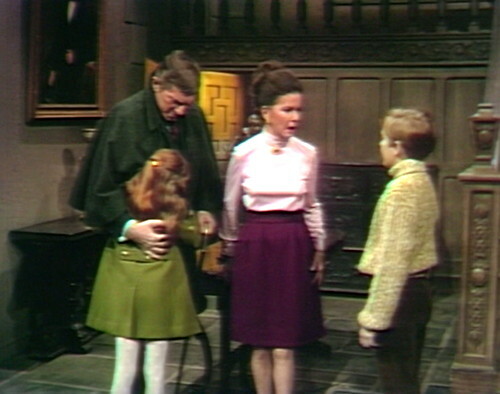 And it wouldn’t be Dark Shadows if it wasn’t immediately followed by a blood curdling shriek, from upstairs. I love “Barnabas the butler” as a description of the character during this period. You’re right that he doesn’t have an actual story during this period — none of the major events occurring directly affect him. Yet I think this humanizes the character somewhat because it’s when I think of him actually caring about other people and actively trying to help them. There is a moment coming up when he involves himself in the werewolf mystery that he almost feels like Stokes at his Dream Curse peak. Episode 467 on April 9 (!) was when Lang first cured Barnabas. It is amazing to think that he hasn’t been a vampire for all this time while Frid has been touring the country and receiving lots of fan mail for playing a tortured vampire when on the show, his character has been moving toward Loyal Family Retainer. And at least the specter of vampirism loomed during the Adam storyline. Now, it’s not even mentioned. We will soon see a brief glimpse of “Vampire on a Mission,” and I think that will change the show. 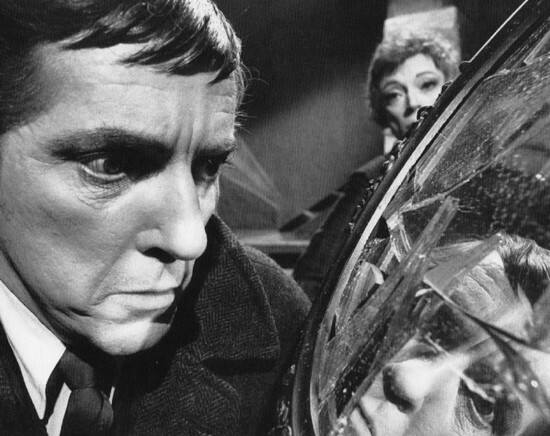 Barnabas will never again be human for as long as he was in 1968. While the Barnabas of 1968 is not, as you say, “a good guy” he has become rather passive, waiting for things to happen instead of making them happen. He does not initiate, but responds. The Dream Curse? He is very passive in it. Adam? Once Julia talked him into adopting him, what the does is react. Getting rid of Cassandra? He watches it happen, and is unprepared for her return as Vampire Angelique. The creation of Eve? It is not his idea, and only does it because of Adam’s threats. Except for the episode of Julia and Tom Jennings, he just sits around, waiting for the next calamity to strike. 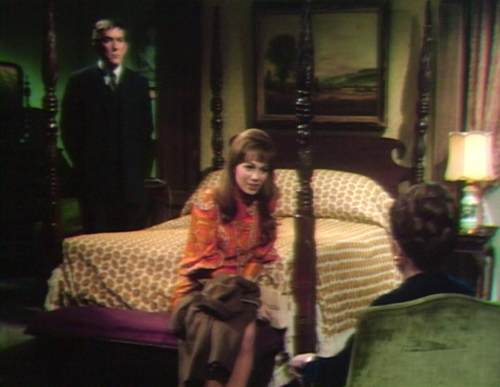 Ultimately it shows that the fans had a decisive hand in creating Dark Shadows. 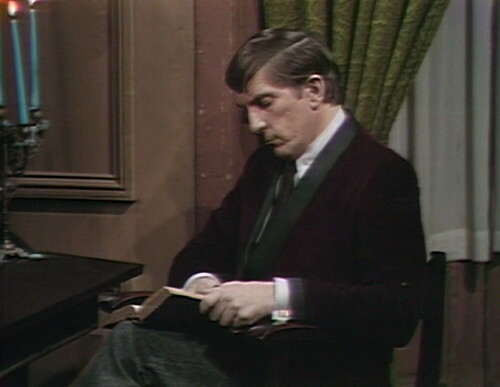 Dan Curtis has mentioned that Jonathan Frid wasn’t his ideal choice for the role of Barnabas, and even admitted that he didn’t particularly like him. But the fans did, which lent them a hidden credit as assistant executive producer(s). Dan Curtis was in Europe at the time of casting of BC and was sent three photos to choose for the role of BC and he chose Bert Convy! Robert Costello thought JF was more gothic, so he overrode (?) DC. This reminds me of when Star Wars The Phantom Menace came out in 1999. The idiots at Lucasfilm were convinced that the kids were going to go crazy over Jar Jar Binks cause he was so goofy and funny. Instead, all the kids gravitated towards Darth Maul and Jar Jar merchandise littered the shelves for years. I think it was a real slap that Joel took for the team. Although they were pretty great at slap play on the show…. Just to nitpick on the werewolf stuff in DS: when Chris is stabbed by Joe, his wound disappears with his transition back to human form. In actual werewolf lore, the human body retained whatever wound the wolf body sustained. A famous French “true werewolf” legend has the Mistress of the chateau found out by a wound to her hand, after her paw was injured by hunters while she was in wolf form, IIRC.